Those games aren't worth a darn thing. I wouldn't even pay a dollar for a sealed copy. That's what I was thinking as well. It IS a sports game after all. The only reason I even asked was because I saw both 95 and 96 sealed at my local flea market for $6 apiece, and they peaked my curiosity. I didn't really think they'd be rare or anything like that, so I passed and googled them when I arrived at home later that day. I was fairly surprised I could only find one listing for "new" for either game, anywhere (and it happened to be triple-digits). Usually games have at least a few "new" listings, no matter how old they are. There are rare sports games but they're very rare themselves. NCAA 2k3 Basketball for the GC, Madden 09 for the DS and NBA Elite 11 are the only ones I know of. Somebody worldwide purchased 96 with box for $12 shipped; for sealed you might be able to list them at $40 or best offer, personally though I wouldn't get involved (since I'm guessing it's not an easy flip). Also they might only be worth $10-15 if you want to sell them in a reasonable amount of time. I have a 2 parter.. Is rival Schools project justice for dream cast sealed rare?? and Can you buy those security seals gamestop uses? Umm, how rare would both Madden 95 and 96 sealed for Gameboy be? I only see one listing for each on Ebay, and both are outrageously priced. Are the games really that desirable, or is the guy just hoping some idiot will pay that much for them? I think you'd get more from recycling them . jk, but I doubt you'd get much, if anything, for them. Um does this really need to be asked. Rare game plus sealed equals very rare. and Can you buy those security seals gamestop uses? Tested it out today using my old Genny RF adapter and played a few levels of Sonic 2. It works! If you are planning on selling it make sure to check out the CD function. Those are notorious for having the CD part no longer work. I have one too that works 75% of the time, but it seems like the motor might be going bad or something because the disc seems to spin down or something. Anyways make sure to check it out. Don't want you to sell it for 100+ and then lose all the money, pay for shipping, fees, etc. Was in WalMart the other day and picked up Mass Effect 2 LE for $42. I couldn't believe it when I saw it in the glass prison. I thought it would be at least $60+ since WM is known for their crazy prices on old games, but it rang up at $42. Checked eBay and it is selling for $150+ for a new, sealed copy. I didn't even realize it was rare. pc? or 360? if its the 360 version, it going to be worth a lot when the 3rd game comes out. The primary difference between the two is the change in publisher. One's THQ, the other is JVC/Lucasarts. The THQ version also has a hard plastic warning box on the back instead of the sticker. 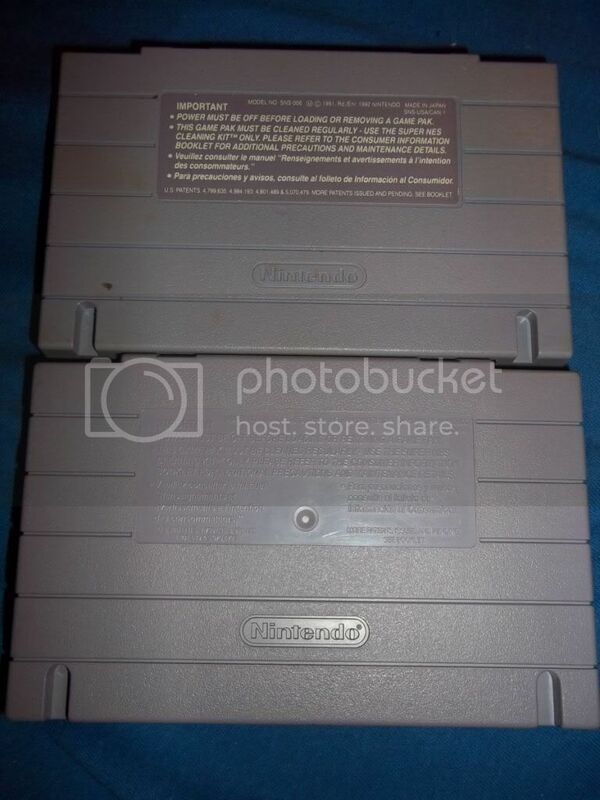 My research seems to indicate that one isn't more valuable than the other, but are there any SNES experts here who can tell me if one is still significantly harder to find than the other? With vintage games I'll generally keep variant copies if it's something major like the label art (things like Metroid, Blades of Steel, Untouchables, and others for NES) but for something minor like a publisher logo, I don't really want to own both unless I have real reason to other than simple OCD. Thanks! Wikipedia says the THQ one is a re-release. Re-releases weren't very common during the 90s but I know it did happen sometimes if another publisher felt that they could profit from it (since there wasn't a major re-seller market back then). 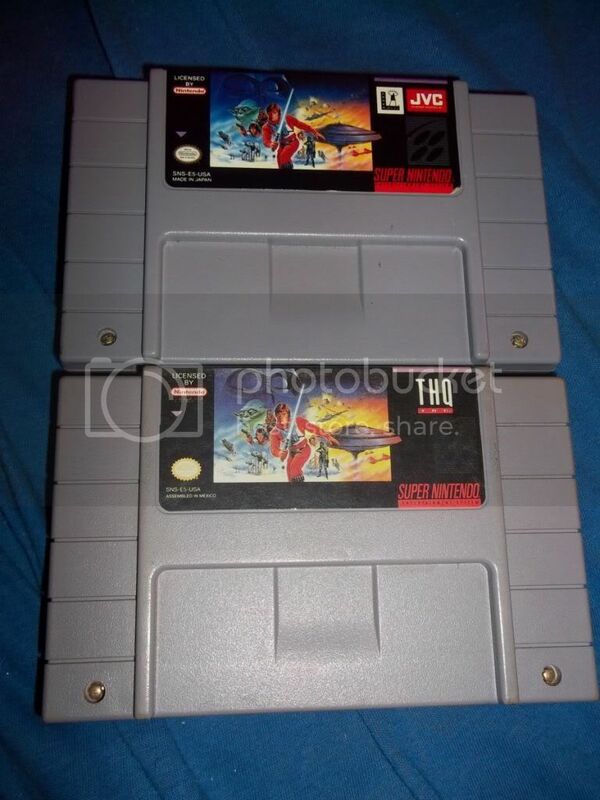 And I'm fairly sure THQ did other re-releases on the SNES, probably the other Super Star Wars games. Additionally, I know Sunsoft re-released all four GB Final Fantasy games. I'm trying to remember if that Assembled in Mexico tag appeared on the box of the Zombies Ate My Neighbors variant (which is sought after). Turbo Grafx lot. I talked him down to 1k. Should I do it? IMO, that's a good buy for $1000. Can't tell from the pictures, but it looks like the guy even made custom cases for the 20 or so games that did not originally come with jewel cases. I would ask to see more detailed pics first. Based on recent Ebay prices, boxed Air Zonk and the Boxed Dungeons and Dragons are easily worth $100 or more each. The turbo Booster Plus is worth about $80-100 and Soldier Blade (with manual but no box) would fetch another $100 or so. Chu Man Fu, Super Star Soldier, Bomberman 93, Jackie Chan's King Fu, Neutopia II, New Adventure Island and Legend of Hero Tonma are each worth about $50+ with manuals and the TG express is another $150-$200 with box. Unfortunately, four of the games don't have manuals-- shockman, soldier blade, chuman fu, and legend of hero. I am unbelievably tempted to pick it up. It would be such a win for my collection. So this seems like the appropriate place to ask this question. I was going through my old game collection and stumbled across a mint copy of Symphony of the Night (playstation greatest hits) still in the original cellophane. I'm pondering selling it, but noticed some games on ebay have been rated by vggrader.com and ask much more alluring prices. Is this worth doing for reselling purposes? Anyone have any experience doing this? It costs a bit of money to get them graded; but if the ROI is low, I won't bother. Assuming it's greatest hits, I don't have my hopes up; but still good to know for future reference! Edited by smiley241275, 26 October 2011 - 08:07 PM. You could get it graded but personally I wouldn't, not for a game that normally lists in the $65-80 range. Now it might be worth doing for a game that regularly hits $200-300+ at auction, but yeah when I see people VGA grading stuff like Final Fantasy X greatest hits I'm somewhere between rolling my eyes and pointing my finger and laughing. At this point grading for most games is going to be for the personal satisfaction of a few collectors and for speculators. P.S. And if you have to grade anything for ps1 or ps2, go for black label/original print run. Thanks for the insight, Indigo and 62t! I'm saving up to buy a house, and it's freakin' killing me to not buy the lot. I mentioned this to him, actually. He said to him it's not worth it to sell it under 1k, and that he would just keep it if it ever got to the point that he couldn't unload it for 1k. He was really cool about it, and said to keep him in mind and if he had it unsold he'd sell it to me. He seemed to appreciate the fact I was a collector and it would go to a good home, so I dunno, maybe I'll check in next week and see if it was still available. Maybe he'll offer to take less if he decides he wants the lot gone. I saw a steelbook "limited" edition for Sniper: ghost warrior at a gamestop recently. It was $29.99 "new" (so opened)...think thats a good price? I'm a bad, bad man. I got amazon to issue 500.00 of my credit to gift card codes to give to the guy, then I'm going to pay 500.00 in cash. But that collection will so be worth it. It helps a lot he's letting me pay half in Amazon credit. Okay, my dad picked up a nes lot today, an some of them were boxed, so I was wondering if any of these were anything. Oh boy. current bid is $2.4K and 1 day-10 hrs left.